Practice Surveying questions and answers for interviews, campus placements, online tests, aptitude tests, quizzes and competitive exams. This set of Surveying Interview Questions and Answers focuses on “Accessories For Linear Measurement – 2”. 1. What is the length of the revenue chain? Explanation: Revenue chain is the type of chain which is mainly used for Cadastral surveying. Length of the revenue chain is 33ft. Length of each link is approximately 2 ft.
2. How many numbers of links in case of revenue chain? Explanation: Length of the revenue chain is 33ft long. It consists of 16 links with each link length approximately 2 ft.
3. What is the length of each link in case of revenue chain? Explanation: Length of the revenue chain is 33ft. It contains 16 links then each link length is 33/16 which gives 2.0625ft. Explanation: In the case of cold places or winter seasons it can be used. In winter and rainy seasons also moisture content is more in the atmosphere. It can easily resist these conditions as it is varnished. 5. Which of the following tape is not made? Explanation: Iron can easily spoil due to rusting. Steel, Invar, linen tapes are long lasting and have protective layer. 6. What are used after every chain length measured on the ground? Explanation: An arrow is inserted into the ground after every chain length measured on the ground. Ranging rods are nearly 4m long which are used in levelling. Wooden Pegs or pegs and offset rods are the survey instruments used in the chaining process in surveying. Explanation: The most common length is 40 cm, which is Indian standard. Arrows are available in lengths varying from 25cm to 50 cm and choose according to our requirement. Explanation: Diameter of the ring is 50 mm. Diameter of arrow wire is 4mm. This is as per Indian Standard codes. 9. What are used to mark the positions of the stations or terminal points of a survey line? Explanation: Pegs are used to mark certain points on the field which require permanent marking. They are made of stout timber, 2.5 cm or 3 cm square and 15 cm long, tapered at the end. 10. Pegs are driven in the ground with the help of a wooden hammer and kept about _________ cm projecting above the surface? Explanation: Wooden Pegs length is about 15 cm and 11cm is driven into the ground. 11 cm is the optimum depth that should be driven into the ground so that it can be withheld. 11. What is the length of Ranging rod commonly used? Explanation: 3 meters are also used but 2 meters is more common. It is as per Indian Standard codes. 12. What is the length of each band in ranging rod? Explanation: Each band is 20 cm deep. It is used on the occasion of the rod that can be used for rough measurement of short length. Explanation: Hence when used on long lines each rod should have a red, white or yellow flag, about 30 to 50 cm square, tied on near its top. 14. Which of the following is used for Ranging out a line when crossing a depression from which the forward rod is invisible, or when it is hidden by the obstacles, such as hedges? Explanation: In the open level ground, intermediate points on a line may also be lined out with straight laths. Ranging rods are generally 4m long which are used in levelling. Explanation: These are not so satisfactory in use. Laths are commonly used in place of Whites. Pegs or wooden pegs are the survey instruments used in chaining. 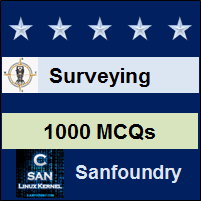 Sanfoundry Global Education & Learning Series – Surveying. To practice all areas of Surveying for Interviews, here is complete set of 1000+ Multiple Choice Questions and Answers.